New Groupon Deal: $20 of food for $10 at The Reef! 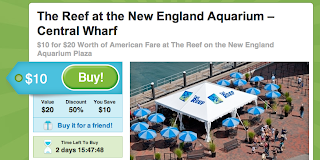 The New England Aquarium has teamed up with Groupon to offer Boston's deal-seekers $10 off of $20 of food at the Aquarium's outdoor restaurant, The Reef. Come touch the sharks and rays at the new touch tank exhibit, and then grab a bite to eat for the whole family right on the Aquarium's plaza. The deal will be up this weekend only, so go grab your groupon now! Keep up on offers like this by bookmarking this blog and connecting with the Aquarium on facebook, twitter and tumblr. World Oceans Day Social Media Contest!